Last Day in Vietnam. Buy at Amazon. LAST DAY IN VIETNAM (2000) contains six short stories of life during war time. From World War Two to Korea to Vietnam, Eisner was there as a soldier and later as a correspondent for P.S. Magazine. These true stories, drawn from memories and experiences, present the reader with a unique perspective on the lives of both soldiers and civilians in a war zone. 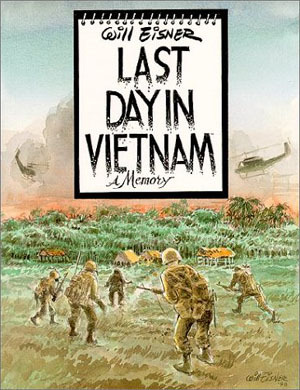 Last Day in Vietnam is Eisner's memoir of stories about soldiers who are engaged not only in the daily hostilities of war but also in larger, more personal combat. During Eisner's years in the military, and particularly during the many field trips he made for P.S. Magazine, he observed camp life at close range. Some of the stories in this novel are comical, some heartrending, some frightening, yet all display the incredible insight into humanity characteristic of Eisner's entire oeuvre. Winner 2001 Harvey Award for 'Best Graphic Album of Original Work'. Visit the Dark Horse Comics page on this graphic novel.